An untimely interruption from Mother Nature late in the final round of THE PLAYERS Championship 2014 created a challenging scenario for the handful of players who returned to the course after a 90-minute delay. Darkness was falling swiftly, so how best to handle the lack of light? Martin Kaymer quietly suggested that in crunch time what your eyes see is not the most important criteria. “You play with your heart,” said the 29-year-old German. Therein sat the reason why Kaymer recovered from nearly squandering all of the three-stroke lead that he owned when he returned after the delay. He double-bogeyed the par-4 15th, played the par-5 16th timidly, then got a bad break at the island-green 17th, a set of circumstances that bruised, but did not beat Kaymer. In a warm and muggy dusk, Kaymer nursed his one-stroke lead into the house with pars on the last three holes, though the one on 17th is unforgettable. His tee shot was seemingly safe until it hit a mound just over the bunker and spun back hard. That it stayed dry by perhaps 18 inches was good fortune. That his chip was weak and left him 28 feet was bad play. 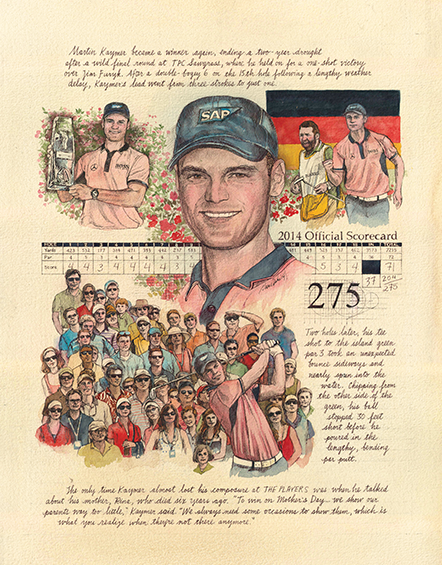 That his par-save in falling darkness dropped was vintage Kaymer. When one final par putt fell, a slippery 3 ½-footer on 18, Kaymer with a 71 was done at 13-under 275, one better than hard-charging Jim Furyk (66). Fitting, the guts Kaymer showed on Mother’s Day, for Rina Kaymer, who had died of cancer in 2008, had always been Martin’s role model and inspiration, instilling in her son an indomitable faith.